EUR/USD: The consolidation will continue until the closing of Forex? Uncertainty continues to dominate the pair EUR/USD this morning, with a lack of clear direction in the short term since yesterday. Recall that despite new records on the performance of 10-year US Treasury bond, and a strong surprise increase in the index of the Philadelphia Fed, the EUR/USD pair failed to make new lows. Traders show indeed hesitant as the end of the week approach, and that the balance sheet weekly bearish 200 pips around since the summit Monday at 1.1995 calls for restraint, and even to profit. 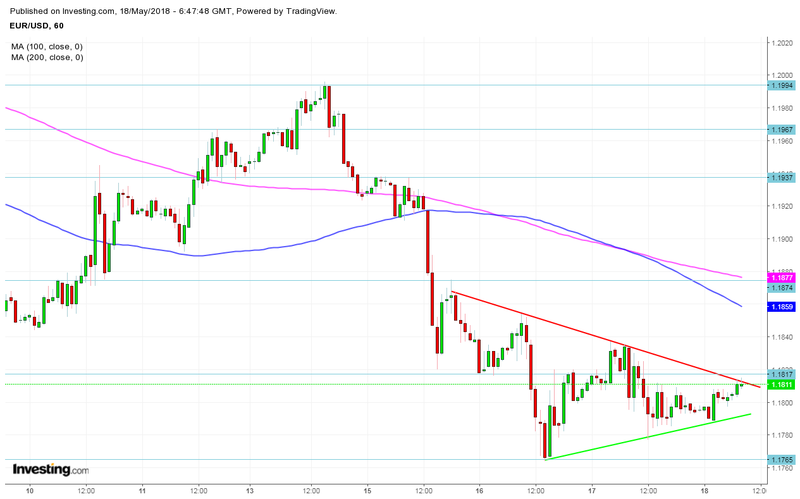 This morning, the consumer price index in the German manufacturing higher than expected helped the Euro to gain a few pips, without consequences on the short-term trend. Today, the economic calendar is not expected to influence the EUR/USD pair, since no statistics are potentially influential not to be expected. We will monitor for a few interventions of members of the Fed, with Mester at 9 o’clock, and Brainard and Kaplan at 15: 15. From a graphical point of view, it should be noted that the recent series of peaks diminishing and hollow croissants draws in hourly data and a triangle, from which it will be necessary to monitor the terminals. Finally, in relation to important thresholds, the area of 1.18 should be considered as a pivot for the short term. The supports are placed at 1.1776 (low of yesterday) and then 1.1762 (low of Wednesday), 1.1720 (hollow of the December 12, 2017), and 1.17. Has the upside, potential resistance can be found at 1.1820-35, 1.1850, and 1.1865-70 in a first time.